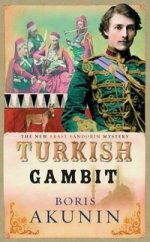 Аннотация к книге "Turkish Gambit"
The Russo-Turkish war is at a critical juncture, and Erast Fandorin, broken-hearted and disillusioned, has gone to the front in an attempt to forget his sorrows. But Fandorin`s efforts to steer clear of trouble are thwarted when he comes to the aid of Varvara Suvorova -a `progressive` Russian woman trying to make her way to the Russian headquarters to join her fiance. Within days, Varvara`s fiance has been accused of treason, a Turkish victory looms on the horizon, and there are rumours of a Turkish spy hiding within their own camp. Our reluctant gentleman sleuth will need to resurrect all of his dormant powers of detection if he is to unmask the "traitor, help the Russians to victory and smooth the path of young love.